If you’re from Quesnel and now reside in a larger city, this is something you’ve heard before. There’s a 50% chance the person you’re talking to knows how to pronounce ‘Quesnel’ (the s is silent…) and a lesser chance they can find it on a map. Fighting this is Barkerville Brewing. Re-established in 2013, they’re putting the town known as Gold Pan City on the map by speaking in a tongue Lower Mainland and Vancouver Island folk are familiar with – fantastic, locally brewed beer. Barkerville Brewing’s roots run deep. Founded in Barkerville in the 1860s during the Gold Rush, the re-established brewery pays homage to the original brewery and it’s home city through their name, beers, label and merch design (props to Bully Design Co.) and tasting room decor. 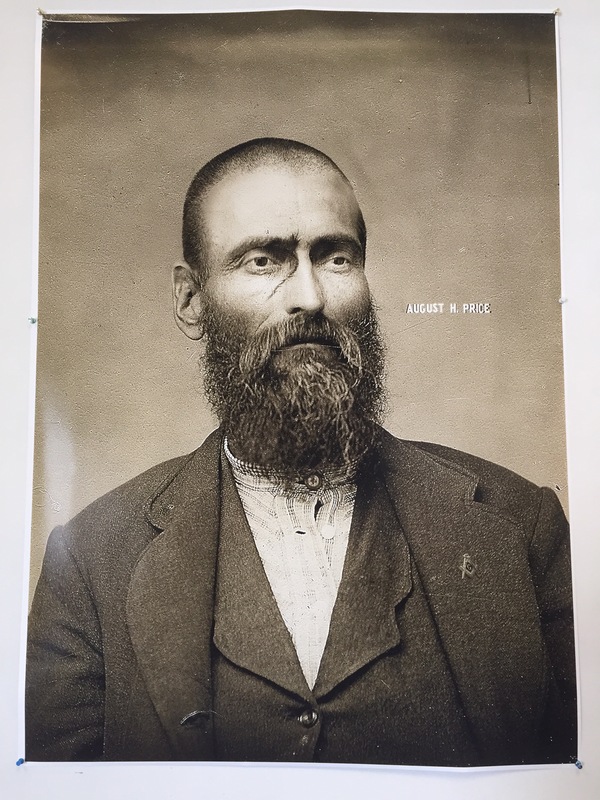 Portrait hung on the wall in the tasting room. 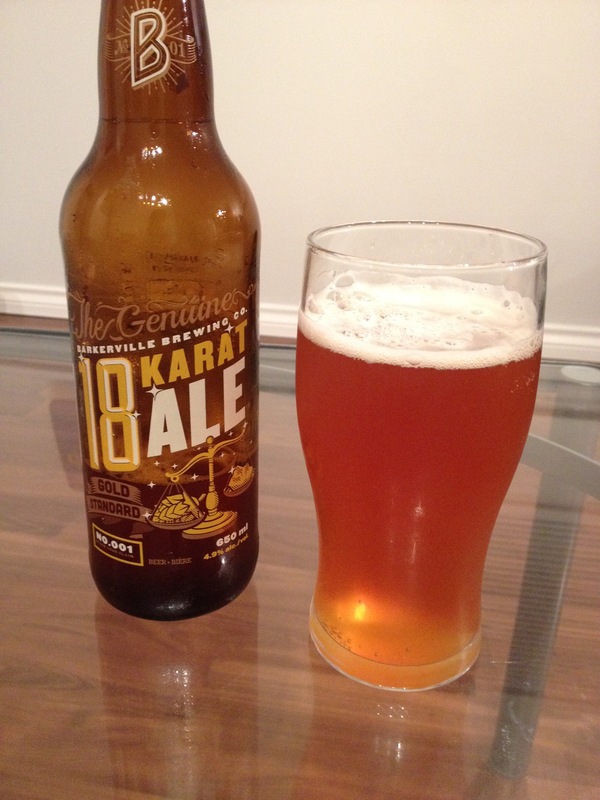 The first beer released by Barkerville Brewing, dubbed the 18 Karat Ale, is an amber ale with a smooth, balanced flavour. Since its release, it has collected some impressive accolades, winning silver in the North American Style Amber/Red Ale at the 2014 Canadian Brewing Awards, and bronze in 2015. Despite their flagship beer’s success, Barkerville Brewing’s Sales Manager, Nolan Foster, expressed how these awards didn’t directly translate to sales. Without an established craft beer community in Quesnel prior to their opening, a large portion of beer drinkers in the city hadn’t been exposed to local beer Nolan coins as “craft forward” before. This made the transition from grabbing a macro-brewed beer – Budweiser, Miller, Canadian, etc. – to one of Barkerville’s products too large of a leap for some. This one-of-a-kind table located in Barkerville Brewing’s tasting room was built by the famous log home builders, the Timber Kings. Mucho Oro Lager, one of the brewery’s more recent offerings, targets beer drinkers accustomed to a traditional lager taste. It was also the first beer that Barkerville Brewing canned, making it a portable option for those looking to grab a 4 pack rather than the craft-common 650 ml bottles. The canning trend has been largely discussed in the craft beer community as of late, with an increasing amount of breweries bringing canning lines into their production process. For Nolan, this is not only a solid beer in their lineup, but also an easier transition from macro-brewed beers for those who are new to the craft scene. It was also “Brewed in honour of the Royal BC Museum’s 2015 exhibition ‘Gold Rush! El Dorado in BC’” according to Barkerville Brewing’s website. While I was back in Quesnel last summer for Billy Barker Days, Nolan and Troy Rudolf, Barkerville’s Brewmaster, kindly gave me a tour of their facilities, and full rundown of the brewing process. It was an eye-opening experience to learn all the steps that go into making one of their beers (huge thanks again guys!). We discussed some of their upcoming seasonal beers as well – White Gold Witbier (ABV 4.9%) and Paydirt Cascadian Dark Ale (ABV 8.2%) – which have become local favorites since their introduction. I had the chance to try their witbier the first day it was being poured and it did not disappoint. A light, refreshing, citrus-tasting beer that is great for summer drinking. It seems that many shared my thoughts as White Gold took home gold at the 2015 BC Beer Awards in the Belgium/Wheat Beer category, placing ahead of some big name breweries from the Lower Mainland. Troy and Nolan proudly holding the award-winning White Gold Wit on the eve of its release. Despite Barkerville Brewing’s recent accolades and growing tap list, they admit the brewery is still a small operation compared to many of the craft breweries in B.C.’s Lower Mainland and Vancouver Island. For the smaller community of Quesnel, they’ve been a great fit. Local businesses in town and the rest of Cariboo region have embraced Barkerville Brewing, offering their beers on tap, which is a great change-up from the area’s standard pub selection. Nolan expressed to me how the support from local business has been awesome so far. Beer flight in BB’s tasting room. On the other end of the spectrum, businesses in the Lower Mainland haven’t been as open to bringing BB beer on tap, as they are already overwhelmed with local beer options that are a lot closer to home. Unfortunately, in these scenarios, Barkerville Brewing is another brewery on what’s becoming a long list in B.C. If the craft beer market in this province is starting to become over-saturated, this is an example of its effects on a smaller micro-brewery trying to compete against the much bigger Parallel 49‘s and Central City‘s out there, who’ve gained mass exposure and popularity in B.C.’s beer industry over the past few years. According to Nolan, being a regular on tap at local Vancouver pub is difficult, but they have been able to get on the tap rotation at two of Vancouver’s most popular watering holes, the Alibi Room and St. Augustine’s. They’ve found more success on the Island due to the connections established by their owner, Russell Ovans – a Victoria native, but it’s an ongoing battle. BB’s beers are offered in all Government Liquor stores, as well as some private stores (Steamworks Liquor store to name one) so they have been able to reach beer drinkers across the province, and even out of province, in that sense. BB’s infamous dynamite tap handle spotted at the Blue Moose Cafe in Hope, B.C. Nolan also mentioned that setting up shop at craft beer events across B.C. 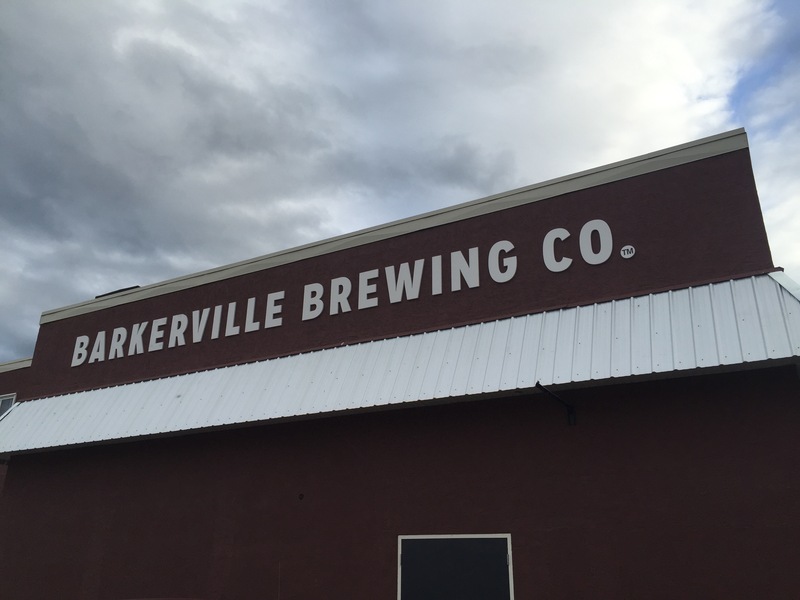 has definitely helped spread the Barkerville Brewing name, and will continue to be a focus for them moving forward. I was able to attend the Vancouver Craft Beer Festival at the PNE last summer, and was stoked to see the Barkerville tent and try the Mucho Oro Lager for the first time. I made sure to rock one of their t-shirts as well – REPRESENT. I’m looking forward to seeing them on June 4 at this year’s VCBW weekend event. Before the weekend event at the PNE that closed off the festival last year, Nolan and the Barkerville Brewing team were also able to participate as one of the Rookies in the Rookies vs. Legends event at 12 Kings Pub – another Vancouver spot where you can occasionally find their brews on tap. The Van Pours team and friends at the PNE for last year’s VCBW. One of these legends – Parallel 49 Brewing – recently came out with their Brews Brothers 2.0 mixer. The premise? 12 collaboration beers, each brewed with a different B.C. brewery. Barkerville Brewing and P49 created a Belgian Golden Strong beer for this project, dubbed “Run to the Hills”. This was an awesome opportunity to increase their exposure to B.C. beer fans, as the Brews Brothers pack is sold at liquor stores across the province and is praised by craft beer lovers. It also places them alongside other great breweries like the 2015 Canadian Brewery of the year – Four Winds Brewing. Having tried the P49 and BB collab brew, I would rank it in the top five of the 12 beers in the mixer. It’s definitely a must try for the craft beer fanatics out there. With Barkerville Brewing continuing to create some fantastic beers, both solo and collaborative, I’m excited to see what’s to come from Troy, Nolan and the rest of the team. I know that whenever I’m back in my hometown of Quesnel, the brewery will always be one of my first stops…would it be wrong to grab a pint before saying hi to my parents?? It’s fantastic to see a local business with great products flourishing in the Gold Pan City and staking its claim across B.C. This entry was posted in Uncategorized and tagged Barkerville Brewing, bc craft beer, Brews Brothers, Canadian Brewing Awards, craft beer, craft beer bc, gold pan city, quesnel, quesnel BC, vancouver, vancouver craft beer, VCBW. Bookmark the permalink.